As part of its long-running comeback campaign, Chipotle has given away millions of dollars worth of free food through numerous promotions and even the chain's firs-ever summer rewards program this year. And although the deals for free burritos have come and gone, Chipotle's annual "Boorito" Halloween deal is back and it offers what's perhaps the next-best thing: $3 burritos. Just like last year, you can score a burrito, burrito bowl, salad, or order of tacos for $3 just by showing up at your local Chipotle in your Halloween costume on -- you guessed it -- October 31st. 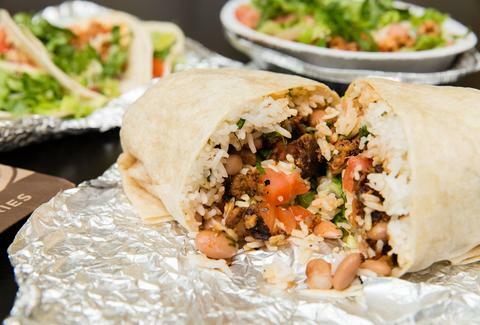 The deal is good from 3pm 'til close at Chipotle's locations in the US, Canada, and Europe; however, it excludes orders placed online or via mobile apps, according to the company's "Boorito 2016" promotion page. In other words, you'll likely end up dining alongside more than a few Donald Trumps and Hillary Clintons, some dude dressed up as Phelps Face, and at least a couple of Pikachus. It's probably a bit too soon to show up in a health inspector costume, though. While the costume requirement might require some work and the burrito isn't exactly free, the deal could very well be your best chance to venture out of your usual steak burrito box and try Chipotle's new chorizo. Sure, trying new things is scary, but it'll be on Halloween after all. Tony Merevick is Cities News Editor at Thrillist and wonders if a food safety inspector costume would be a bit too on the nose. Send news tips to news@thrillist.com and follow him on Twitter @tonymerevick.